The advantages of an inground lift (and, especially a one post inground lift) are that it takes up very little space in the shop and it does not interfere with the mechanic�s ability to open the doors of the vehicle being lifted. This means that, in a small repair shop, the mechanic has more room to move around the vehicle when the lift is employed, and he has more work space in the shop when the inground lift is retracted to its stored position in the shop floor. In a large shop such as those in automotive dealerships, using inground lifts means that the dealer has room for more lifts and is able to increase his throughput of repairs, thus enhancing the profitability of his service business. Two approaches have been taken by the industry to convert pressure from the shop air system to lifting force for the lift. In one, the shop air is plumbed to an external reservoir which is filled with hydraulic fluid. The reservoir is plumbed hydraulicly to the auto lift cylinder. When the shop air pressurizes the hydraulic fluid, the fluid becomes pressurized and applies force directly to the piston in the lift to raise the load on the lift. The other approach is more common in the author�s experience, and is illustrated in Figure 1. This section view shows the lift in a position representing almost full retraction to the floor level. The arms which contact the vehicle to be lifted and the plate ("bolster") which connects the rotating arms to the plunger are not shown, in order to keep this illustration simple. The lift contains hydraulic fluid, but the pressurized air is actually used to contact the working face of the plunger (piston) and to raise the load. The hydraulic fluid is used as a means of sealing the pneumatic pressure and of controlling the speed of the plunger through use of an orifice in the bottom of the plunger. . . . Continue to article and footnotes (PDF). Peter J. Weller is President of Design Engineering Group in Redondo Beach, CA. He has a BS degree in Mechanical Engineering from Cornell University, and an MS degree in Mechanical Engineering from Stanford University. He is a registered PE (Mechanical) in California and has 40 years of experience in engineering design; manufacturing of auto lifts, truck bodies, and construction equipment; and as an expert witness. 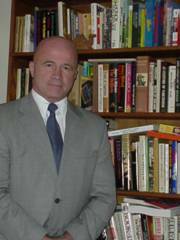 See Peter J. Weller's Profile on Experts.com.